Recorded in a number of spelling forms including Byars, Byers, Byre, Byres, Bier, Biers, and Buyers, this is an English topographical or occupational surname, and possibly of pre 7th century Viking origins. 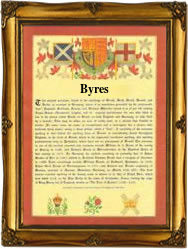 It derives from the word "byre", meaning the cattle barn or dairy, and is one of a group of surnames which originate from working or living on a farm. These include Bull, Heffer, Stott, and Palfrey, all relate to the keeping of livestock, the prime agricultural function of the pre-Norman period before 1066. Perhaps not surprisingly given the importance of the occupation, this is one of the earliest of all recorded hereditary surnames, and it is also perhaps not surprising that it was in the cattle breeding regions of the Fens and the West Country, where originally the surname was most prevalent. There is also a possibility that in some cases the surname may have descended from an Olde English personal name "Bye", of unproven meaning. This is suggested by the recording of Thomas filius Bye of Cambridge, in the Hundred Rolls of the year 1279. Other early examples of the name recording include John Attebey also in the same Hundred Rolls of Cambridge, and William en le By of Somerset in 1327. The famous portrait painter of the 17th century Nicholas Byer, who died in 1681, was actually born in Norway, although possibly of English parents. The first known recording is believed to be that of Hugo de la Bye, a witness at the Assize Courts of Somerset, in the year 1243. This was during the reign of King Henry 111 of England, 1216 - 1272.